Grapevine, Texas (May 24, 2011) - Enjoy SummerBlast in Grapevine all summer long! Grapevine, a one-of-a-kind summer destination blending historic and contemporary attractions, offers exciting activities for visitors coming from near or far. From May 27 through Sept. 5 the city has completely filled its days and nights with an abundance of unique summer events. With four exciting, new attractions and favorites like weekly fireworks, the Grapevine Vintage Railroad, summer markets and festivals, Lake Grapevine and amazing hotel offerings, Grapevine truly is the premier summer destination of North Texas. New on-tap this summer include LEGOLAND® Discovery Center Dallas/Fort Worth, where visitors feel like they have entered a giant box of LEGO® building bricks, containing more than two million LEGO® bricks! Learn how LEGO® bricks are made, the secrets of master LEGO® builders and enjoy interactive rides and activities. The all new SEA LIFE Grapevine aquarium has more than 30 spectacular displays of sea animals for visitors to enjoy. The magnificent centerpiece is a tropical ocean tank with a walk-through underwater tunnel. Featuring saltwater and freshwater species, the aquarium offers unique interactive opportunities for people of all ages, including guided tours and feeding demonstrations. 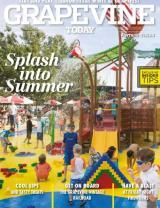 The Gaylord Texan Resort boosts a brand new Paradise Springs Resort Pool and Lazy River. Pg. 2 - SummerBlast cont. Spanning more than 10 acres, this complex only for resort guests features a 600-foot lazy river and 6,000-square-foot family lagoon with walk-in beach. journey through the Old West. In this interactive comedy, guests might find themselves pulled into the action of this wacky production set in the 1880s. Cowboys, cattle herds, drifters, saloon girls, gamblers, and anyone wishing to make a dollar complete the fun. Popular SummerBlast favorites include celebrating every weekend like it&apos;s the 4th of July! Take in the Friday Night Fireworks show. All summer long, the night skies overlooking Grapevine will be illuminated as Grapevine presents the Friday Night Fireworks every Friday night through Sept. 2 starting at 9:30 p.m. The music from each fireworks show can be downloaded at www.GrapevineTexasUSA.com/Summer. Parents -- grab the kids and giddy-up to the Grapevine Vintage Railroad this summer to experience the Great Train Robberies of North Texas. From June 4 - Sept. 4, your little partner will be ready with boots and spurs for this Western adventure. Enjoy staged train robberies every Saturday and Sunday on the Grapevine to Fort Worth excursion. Looking for a place to chill out? Come out to Grapevine on the first Friday of every month for the First Friday Film Series inside the Palace Theatre. This year&apos;s flicks on the big screen include: Raiders of the Lost Ark, Jaws and Follow That Dream. Admission is $5.00. Longing for the good ole&apos; days? The 5.2-acre Nash Farm near the historic downtown provides a snapshot of farming life in Grapevine more than 100 years ago. The farm is the remaining piece of the 450 acres Thomas Jefferson Nash and his family purchased starting in 1859 to grow crops and raise livestock. Stop by for special events like Dairy Days, Charlotte&apos;s Web and Fridays on the Farm. Pg. 3 - SummerBlast cont. open every Thursday and Saturday from 9 a.m. to 2 p.m. until October 15. For foodies and fresh produce lovers, there&apos;s also the Farmers Market open every Thursday through Saturday from 8 a.m. to 4 p.m. Peruse the unique displays and indulge in something special this summer! Finally, Grapevine&apos;s excellent shopping means visitors will never want for something unique to take home or purchase for that special someone. Add to that sumptuous dining opportunities and the summer vacation package is complete. There&apos;s so much to see and do in Grapevine this summer! With 19 fabulous hotels and resorts offering special summer hotel packages and rates, visitors are guaranteed to soak up plenty of fun and sun. For additional information about Grapevine&apos;s summer events, attractions, or hotels, please contact the Grapevine Convention & Visitors Bureau at 800-457-6338 or 817-410-3185 or visit www.GrapevineTexasUSA.com/Summer.